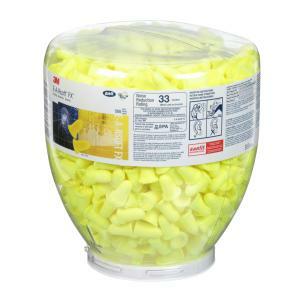 This refill system makes it easy for workers to access earplugs for hearing protection. 3M E-A-Rsoft FX Dispenser Bottle Refill is made to use with the 3M One Touch Pro Earplug Dispenser. Each refill bottle contains a supply of 500 pair 3M E-A-Rsoft FX Uncorded Earplugs and easily mounts into the dispenser. 3M E-A-Rsoft FX Dispenser Bottle Refill is made to use with the 3M(TM) One Touch(TM) Pro Earplug Dispenser. Each refill bottle contains a supply of 500 pair 3M E-A-Rsoft FX Uncorded Earplugs and easily mounts into the dispenser. This system makes it easy for workers to access earplugs for hearing protection.